Bento picks are a fast way to decor your bento. 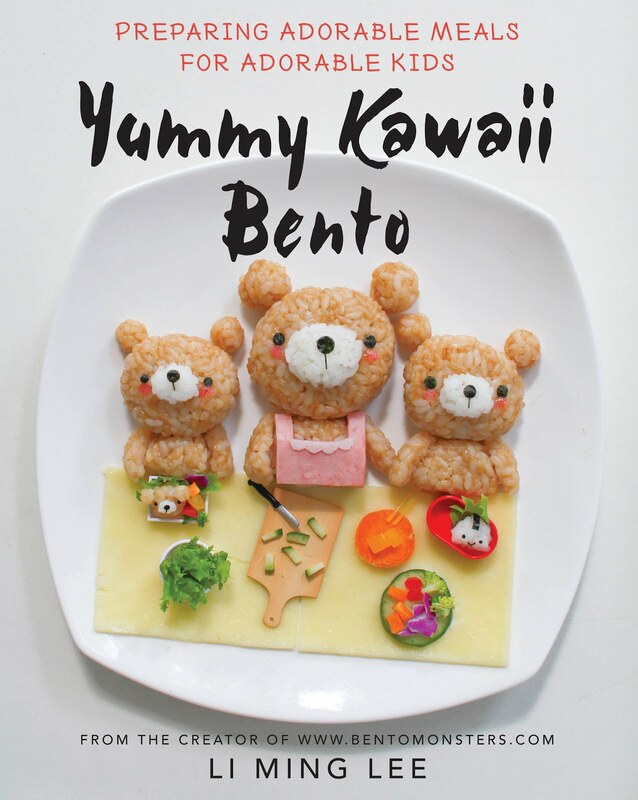 They are great when you are in a rush, and still want to make a kawaii looking bento. :) There are lots of varieties out there and you will be spoilt for choice. 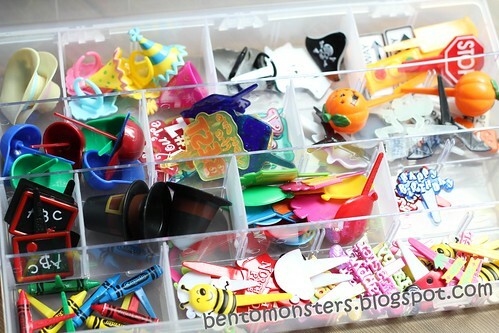 I love bento picks and often can't resist getting more. 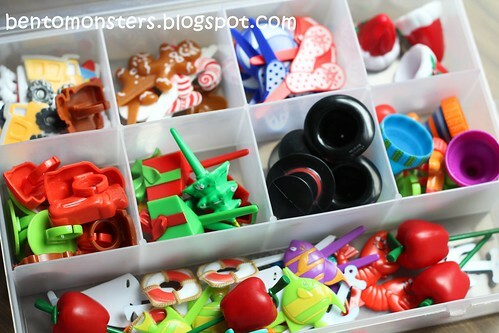 I keep them in compartment boxes like this, I find it easier to pick and choose them this way. And here's another box of picks that I've collected. Lol, yah, I think I'm collecting them, more than using them. 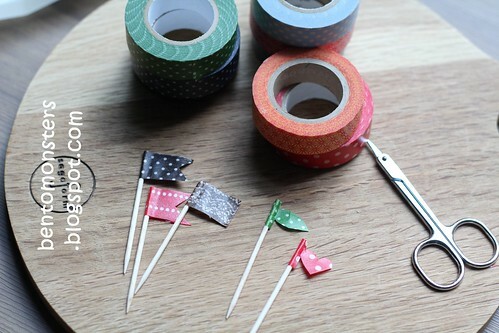 These are cupcake toppers and picks. Yes, you can use them for your bentos too. However, do take note that they are much bigger as compared to the food picks. You can also make your own food picks. I'm sharing some of the materials you can use below. Washi tapes are my favourite. They are available from scrapbooking shops. 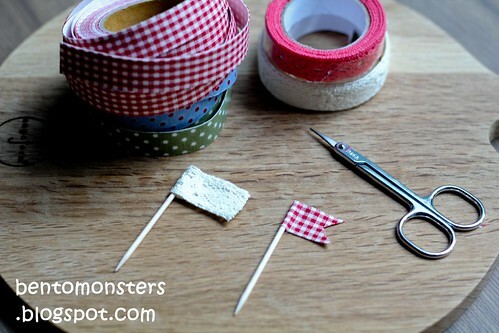 You can also use fabric and lace tapes. 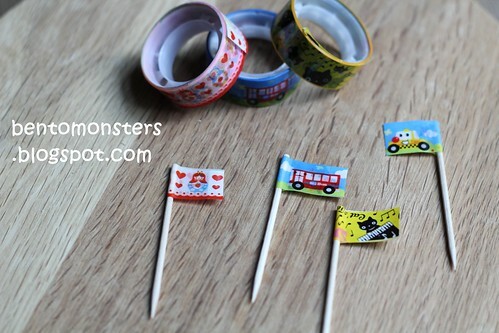 These cartoon tapes make very cute picks. 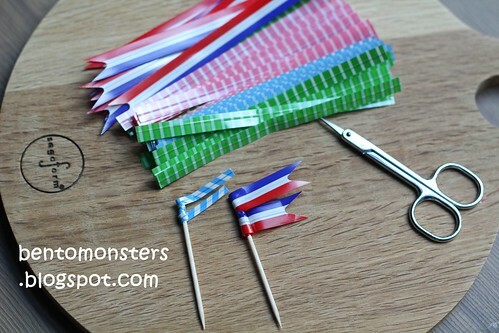 These wrapping ties can be used too, just twirl them round the toothpick. Do note that these materials might not be totally safe to be used on food, so as a precaution, do avoid the tape/sticker from touching the food directly. 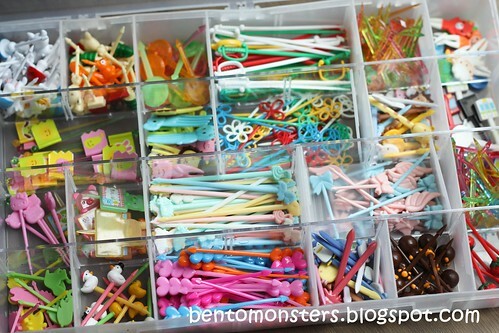 Such a huge collection and so neatly packed! If you ever want to sell or trade, let me know.Hehehe. Rina, they are too precious to sell/trade for now. But I seriously dunno what I'm going to do with them n my other tools when I quit bentos one day. Hiaz. Hi! Where are u located? Can u kindly leave a name or nick the next time u comments, tks. :) The daiso here cost $2 n I'm located in spore. But not all picks u see are fr there, so will cost more n are not found in Daiso. The top hats, crayons n pirate picks are fr Jmama, link on my left hand sidebar. 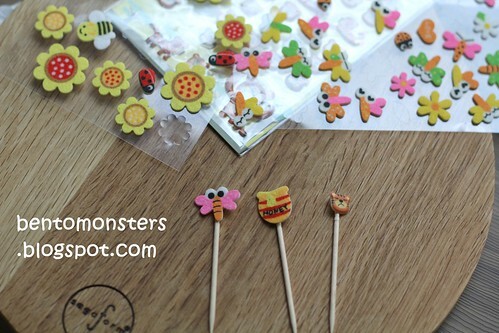 They are cupcake toppers, so depending on where u stay, u can also get them via eBay n baking supplies shops. I've collected them for over 4 yrs, but I've been buying more in the past one yr plus. Daiso hv the fabric tape. Are u in KL? 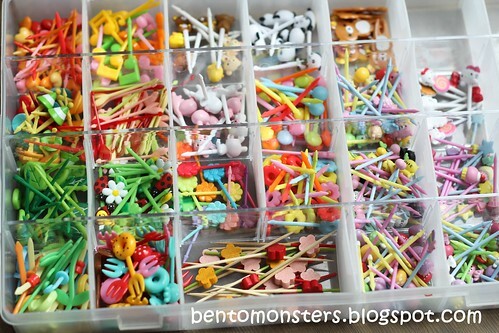 Heard there's this 100 yen shop at Ikano power centre which hv lots of bento stuff! Wow! So many picks! Really jealous ;) The ones with the tapes I know, too. But the ones with the stickers are new for me. It's so great and nice! Yah, I can't seem to resist picks! But trying hard to ctl, since I dun really use them a lot in my bentos, n I really dunno what to do with them if I quit. Too precious to give away n yet no point keeping then. Lol, this is one 'wow' I dun want, embarrassed not to put them to gd use. Iol, I love the boxes for the fd picks, they are the biggest compartment boxes I've found. I actually want duplicates, n I even buy more than one pack for some designs, coz I sometimes find I dun hv enuff. Bad eg though. Wow wow... You really have lots of picks! Like a boss. Your blog's new look is very pretty too. So pro! Lol, tt's why I'm very scared to stock take. Next round I dig out all my cutters or silicon cups, lol. Looking forward... and enjoy your trip to Port Dickson! That's an awesome collection! I am trying to build up but am having a hard time because my kids are older and share in the washing of bentos. Which means every now and again the disposal claims a pick or two.